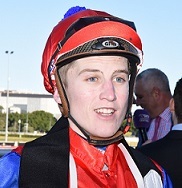 Apprentice Sam Weatherley, who is preparing to call Sydney home in the near future, made sure he left no stone unturned when he was booked some time ago to ride promising stayer Just Shine at Randwick on Saturday. Apprentice jockey Sam Weatherley (Pic: Stave Hart). Weatherley will return to New Zealand next week for their awards, where he’ll claim the champion apprentice title for the second time, and to finalise a permanent move aimed at claiming the 2018-19 Sydney apprentice crown. With races like the Newcastle Cup on the radar for the Clare Cunningham-trained Just Shine, who tackles the Bob Ingham Handicap (2400m), Weatherley subbed in for Jason Collett to ride the six-year-old in a fitness trial last week to get an idea of what to expect. And it filled him with confidence. “I wanted to have a sit on him before Saturday because it’s an important race for him going forward,’’ the 19-year-old said. “I really like the horse, he gave a good feel and the way he trialled, even though it was 1200m, running through the line was very encouraging. Just Shine has an unbeaten record from two starts at Randwick and was $4.40 second favourite with TAB behind Raqeeq ($3.20) on Friday for his first attempt at 2400m. Raqeeq managed to lower Just Shine’s colours when they met at Rosehill on July 28 but Punters Intel shows he ran the fastest last 200m of the race in 11.83 and covered 5.8m more that the winner who gained inside runs. With Weatherley’s 2kg claim, Just Shine meets Raqeeq 4kg better off at the weights for a 1.3 length defeat. “I suggest if he gets the right run he should have something there when he gets to the corner,’’ he said. “At his last couple of runs his last 200m have been pretty smart and up to 2400m I don’t see as any issue at all. If the Forum Handicap (1000m) plays out to Weatherley’s preferred script then he expects Kosciuszko hopeful Sharpe Hussler to repeat the booming finish that took him to victory three weeks ago. The gelding produced the fastest last 600m of the day at Rosehill on July 28, running 33.18 including an 11.25 last 200m (Punters Intel) and Weatherley said it took him by surprise. “He gave an incredible feel, it was quite scary the turn of foot when he got out,’’ he said. “You have to ride him that way I think, get back and hope the speed is on.